A nasty Italian syndicate threaten to reclaim the site of a Chinese restaurant in Rome. Luckily, the owners are cousins of Bruce Lee, who is sent from Hong Kong to help out his struggling relatives. A flimsy story (even by chopsocky standards) proves categorically that writing wasn’t one of Lee’s fortes. But as the film’s director, producer, choreographer and star, this is the closest thing we have to deciphering Lee’s personal cinematic vision. As director, Lee utilises the picturesque Roman backdrop for a number of smart location shots, steadily building the character development in the absence of any real action. Lee keeps his audience in suspense until a five minute double nunchaku duel with a group of Italian hoods sets up the second half of the film, culminating in a gladiatorial fight to the death with US Karate champ Chuck Norris at the Colosseum. The fight is considered something close to a masterpiece, perhaps the greatest martial arts battle ever caught on celluloid. But this is not Lee’s best work. 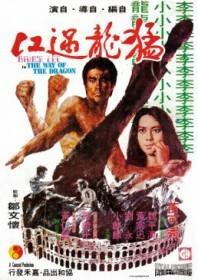 An ambitious but slightly muddled film sandwiched by his two genuine triumphs, Fist of Fury and Enter the Dragon.